India - U.S. alliance threaten South Asia? Was suicide bomber’s target the President or PM? නව පෙනුමකින් හා නව ආරකින් ජනවාරි පලමුවෙනිදා සිට News-Lanka ඔබ වෙත. New look and New version of News-Lanka from 1st January 2009. Dr Jayawardana was in Switzerland trying to get the UN and INGOs to pressure Sri Lanka to stop the war. His attempt was described as a last ditch attempt to prevent the fall of Tamil Tiger bastian Kilinochchi to the rapidly advancing security forces. It was reported that, Dr Jayawardana met the head of Swiss Tamil Forum, which is a front organization of the Liberation Tigers of Tamil Eelam (LTTE). When UNP MP John Amaratnga raised this at a UNP Parliamentary Group meeting, Dr Jayawardana objected to it, but did not deny the meeting with the LTTE leader in Geneva. Mr Amaratunga said that Dr Jayawardana’s statements abroad were detrimental to the prospects of the UNP. Indian National Congress activists and anti-terrorism groups expressed shock at recent utterances of the Sri Lankan politician Dr Jayalath Jayawardana who urged Indian intervention to save the beleaguered Tamil Tigers in Kilinochchi. They said that Dr Jayawardana’s Press Release issued in New Delhi stating that the Tamils in the north are starving and India should intervene to save them is contrary to the reports issued by UN bodies and various INGOs on the humanitarian situation. "Is the UNP, of which Dr Jayawardana is a member, endorses his call?" Satish Kumar of Delhi Free Thinkers’ questioned. "Dr Jayawardana is trying to save the LTTE, which is facing defeat in the battle front. We in India feel that the UNP should support the government’s efforts to liberate the Tamil masses from the LTTE grip and to restore their democratic rights. In India we all join when there is a national issue," he pointed out. Dr Jayawardana’s press release, which was published in Tamil newspapers like Erasorthi of the DMK and websites like OneIndia, said that the people in the north are living like slaves without food and other essential items and stated that Sri Lankan government has refused to allow the NGO community, social workers and priest access to the LTTE controlled areas. He also said that the military operations in general and air raids and artillery attacks in particular have resulted in the displacement of over 150,000 civilians. He added that Bishop of Mmannar has confirmed this personally to him. The Indian media highlighted his press release and said that as Dr Jayawardana is a Sinhalese MP belonging to a national party, his statement should be taken very seriously. However, the Indian analysts are of the view that Dr Jayawardana has distorted the facts and completely ignored the fact that the military operations were against the Tamil Tigers, "a bunch of terrorists who massacred thousands, including our beloved former Prime Minister Rajiv Gandhi". They also expressed doubts whether the UNP would back the anti national utterances of Dr Jayawardana and pointed out that the timing of Dr Jayawardana’s attack on Sri Lanka Government coincided with the visit of President Mahinda Rjajapaksa to New Delhi. They also pointed out that Sri Lankan Foreign Minister Rohitha Bogollagama said in New Delhi that the civilians were not harmed and the Government has a policy of zero tolerance when it comes to civilian casualties. "The fight against the LTTE is continuing systematically and the troops make every effort to avoid civilian casualties. In Iraq or Afghanistan, there are hundreds of civilian deaths and in Sri Lanka situation is well in control," Indian analysts pointed out. "What we want to know is the UNP leader Mr Ranil Wickremasinghe is endorsing Dr Jayawardana’s pro’LTTE stance?" they asked. "Mr Wickeramasinghe never made such public statements in India." Several leading Tamil political analysts and university dons expressed surprise at India’s attitude of tolerance towards Tamil National Alliance (TNA), which is a proxy of the Liberation Tigers of Tamil Eelam (LTTE), a terrorist organization banned in India. They said that it is a pity that India, instead of exposing these subversive elements, encourages them to mobilise Indian public opinion against the democratically elected government of Sri Lanka. "How is it that India is tolerating anti Sri Lankan government campaign nurtured and conducted by TNA parliamentarians?" they asked. "New Delhi is well aware of the fact that TNA is a proxy political party of Liberation Tigers of Tamil Eelam, which is a terrorist outfit that has been banned in India since 1992 and any direct or indirect help to TNA tantamount to helping the killers of Rajiv Gandhi." The TNA parliamentarians are provided with visas to enter especially the state of Tamil Nadu and to conduct anti-Sri Lanka Government political activities. Since of late, TNA Parliamentarians with patronage from the Tamil Nadu state government are involved in planning and participating in protest rallies and campaigns against the Government of Sri Lanka. It is also alleged they are contributing huge amounts of money to various political parties as well as to numerous Tamil language dailies, weekly publication to carry their anti- Sri Lanka Government campaigns in Tamil Nadu. "India should encourage Sri Lankan efforts to eliminate terrorists and to liberate the Northern Tamils from the grip of the LTTE," they pointed out. “Sri Lanka government has already restored democracy in the east and the Tamils in the North also eagerly waiting for these rights. Why Indian Government is not taking any actions against these TNA Members of Parliament for making use of the Indian soil to aid, abet a proscribed terrorist organization?” the analysts asked. Tamil National Alliance parliamentarians are participating in protest rallies against Sri Lanka as well as they are allowed address public meetings to propagate and glorify terrorism. “By doing so, India is denying the democratic rights and freedoms to the Tamil people in the North”. Families of number of TNA Members of Parliament namely M K Shivajilingam MP, Adaikalanathan MP, Mavai Senathirajah MP are allowed to live in Tamil Nadu and these MPs as well as other Tamil MP’s who represent the LTTE in proxy are allowed to freely conduct anti- Sri Lankan Government political campaign. Since of late the presence of TNA parliamentarians and their political activities have increased in Tamil Nadu and they openly participate in the hate campaigns against Sri Lanka whipping up anti-Sri Lankan sentiments. It is noted that State Government of Tamil Nadu, which is responsible for maintenance of law and order in the state, have failed to take any actions against these parliamentarians. Furthermore, several Sri Lankan Tamil Members of Parliaments have participated in the events organized even by the Tamil Nadu state government leaders. The noteworthy one was the human chain demonstration recently conceived and organized by the Chief Minister of Tamil Nadu. Now it is learnt that two Sri Lankan Tamil MPs sympathetic to the Tamil Tigers are in New Delhi to meet political leaders as part of their efforts to bring about a ceasefire in their country. A captured LTTE woman has revealed ongoing LTTE attempt to strengthen its frontline positions by deploying hundreds of civilians. She was among four female cadres captured by fighting elements of the Task Force I (TF I) conducting operations at Vallayarkuttirukkumoddai, about four kilometres east of the A 32 (Mannar-Pooneryn road) on Tuesday. The army identified the informant as 28-year-old Ms Nilaveli, an English teacher who had been coaching Grade 6 to 10 students at the time she joined the LTTE at gun point. Captain Hemantha Dayaratne of the army media told ‘News-Lanka’ that she had graduated from the reputed Kopay College of Education (English Faculty). He said that Ms Nilaweli, while fighting against the army had been drawing a government salary from the Department of Education in Kilinochchi. She had joined the organisation to save her teenage brother and sister from forced conscription, the official quoted the trained teacher as saying. According to her many of her batch mates joined the LTTE to save their loved ones. The LTTE facing a severe dearth of trained cadres has forced a large group of public servants including lower grade employees of the Department of Agriculture and local employees of INGOs to resist the army advancing on its strongholds, both east and west of the A9 road. The LTTE has also deployed over 100 male and female teachers alongside its frontline units now struggling to thwart a relentless army advance. A special tribunal headed by a Delhi High Court judge upheld the Centre's notification for extending the ban on the Liberation Tigers of Tamil Eelam for another two years. The notification extending the ban on the Liberation Tigers of Tamil Eelam, declaring it as an unlawful association, was issued by the Union Home Ministry on May 15. Justice Vikramjeet Sen, who was heading the special tribunal constituted under Unlawful Activities (Prevention) Act, upheld the government decision saying that there is sufficient evidence against the organization to justify the extension of ban. The LTTE, also known as Tamil Tigers, is a terrorists group that has waged a violent campaign against the Sri Lankan government since the latter part of 1970s in order to create a separate Tamil state in the northern and eastern part of the island nation. The group-led by V Prabhakaran has been proscribed as a terrorist organization by several countries including the United States. The LTTE was involved in the assassination of former Indian Prime Minister Rajiv Gandhi in May 1991 and the group has been banned by India since 1992. Additional Solicitor General P P Malhotra, while appearing before the tribunal, had contended that although the LTTE was based in Sri Lanka, it had sympathizers and agents on the Indian soil and there was urgent need to continue with the ban. India was the first country ban the LTTE followed by USA, United Kingdom, 27 European Union Countries, Canada and it is learnt that Australia as well as Malaysia are seriously contempt plating on banning this terrorists’ outfit in their soil. Counsel for the UDA Nihal Jayewardene, told the Court that the UDA abided by the recent Supreme Court judgement which declared that the alienation of this property to a private entrepreneur was mala-fide. The Court ordered the retired president Mrs. Kumaratunga to pay Rs. 3 million as compensation to the state, for misdirecting the Cabinet to believe that this land was alienated for a public utility purpose counsel Jayewardene also told the court that the UDA and the Sri Lanka Land Reclamation and Development Corporation are having discussions to decide how best the land could be used to benefit the people. A draft of this master plan is to be submitted to the court within two weeks. The UDA is awaiting the valuation report from the Chief Government valuer in respect of the constructions done on this land. This report is also to be submitted to the court shortly. The court yesterday issued notice on the permanent commission to investigate bribery and corruption. The court ordered that the commission should submit their findings in respect of the mala-fide deal and submit the progress of their investigation at the next hearing, in two weeks time. Senior State Counsel N. G. Pulle, said that the Commission has started on the Investigation. Uditha Egalahewa appeared for seven hotelier employees of the Waters Edge Club. He said that his clients are likely to lose their jobs. They are top hotelier, but unable to secure elsewhere as the hotel industry is at present having a lean time. The court directed Mr. Egalahewa, to check the employees employment data and to check with the Commissioner of Labour, what best relief could be granted for them. The counsel for the UDA said that the Chairman of the UDA, had expressed willingness to retain any competant employees. Faiz Mustapha PC, appeared for some former land owner of Battaramulla, who had not received compensation, when the land was originally acquired by the state. The court advised the UDA to look into this matter. The bench comprised the Chief Justice Sarath N. Silva, Justice Shirani Tilakawardene and Justice Saleem Marsoof. wouldn’t take place as long as the LTTE remained armed. "There’ll be no change in our position," he told News-lanka yesterday. He said that the LTTE political wing leader Nadesan had conveniently forgotten the LTTE quitting talks in April 2003. "We abrogated the ceasefire years later," he said adding that the ground offensive was on track with the army making steady progress. A series of hit and run attacks in the east, particularly directed at the renegade Karuna faction has prompted Army headquarters to review security measures in place to meet the LTTE challenge. The army top brass has expressed serious concern over what a security official called an alarming increase in LTTE activity. LTTE infiltrators have claimed the lives of a dozen Karuna loyalists in the recent past. Military spokesman Brigadier Udaya Nanayakkara said that action was being taken to neutralise the threat. "They are operating in small groups trying to cause panic," he told News-lanka yesterday. He speculated on the possibility of the presence of sleepers awaiting orders to launch operations. With the army pulling out bulk of the infantry and support units for operations on the Vanni front, the Special Task Force (STF) has had to play a pivotal role in anti-insurgency operations in the East. STF Commandant DIG K. M. L. Sarathchandra told News-lanka that the LTTE was making a desperate bid to make its presence felt in the East. He said some of the infiltrators had been killed and their arms, ammunition and equipment recovered in operations carried out by his troops. A confident STF chief said that the LTTE wouldn’t be allowed to exploit the situation. "We are on a heightened state of alert and will do everything possible to destroy them," he said. Responding to our queries, he said that the LTTE had launched a major false propaganda campaign to deceive the Tamil Diaspora and people living in the South. He said that reports on several successful LTTE attacks on the STF had been posted on the pro-LTTE Tamilnet in the recent past. But nothing could be more ridiculous than the claim that the Jayanthan Brigade killed ten police commandos and wounded two at Koappaaveli on the Badulla road on November 4. TamilNet also claimed that the STF had lost three personnel two days later during a 30-minute confrontation in the Panama area. The STF chief said that LTTE propagandists had based the two false reports on actual confrontations between LTTE cadres and his troops. "We didn’t lose any personnel although police commando Bandara received gunshot injuries during the second encounter," he said. According to him, the LTTE had lost one cadre identified as Satyamurthi. The LTTE claimed that one of their units Friday (November 7) had killed four Sri Lankan military personnel including three police commandos and wounded two police commandos at Kohilaela, Tampitiya in the Ampara District whereas the victims were two Civil Defence Force personnel and a policeman providing security to farmers, he said. He said that over 500 fresh commandos would be available for deployment in a few months. He said that the STF was deployed in the Ampara and Batticaloa Districts and a section in Yala. By end of this year, the STF would take over the entire Yala, he said. The Police Headquarters Friday assured immediate disciplinary action against some personnel of the Siyambalanduwa Police Station with regard to their alleged failure to act against five persons from Galamuna area who were caught with some invaluable ancient artefacts in August, with the Policemen themselves pocketing the same items. ASP Neil Hettiarachchi, of the Crime Division told The Nation, that though there had been department lapses when it came to Police functions, they were not trying to hide anything or whitewash any wrongdoers. Several accusations were made against the Siyambalanduwa Police in connection with the finding of a small box full of jewellery believed to have belonged to Queen Sugala of the Polonnaruwa period, while the four persons were clearing a sugar cane cultivation of weeds and the subsequent recovery of these items by the area Police without either producing the youth or the jewellery in court. Responding to further charges that the investigations conducted by Police Headquarters into the incident were also covered up, ASP Hettiarachchi said, instructions had been given to Moneragala Division, SSP G.D.A.K. Senaratne, who is legally responsible in carring out an investigation, to see whether these Police personnel have acted dishonourably in handling the case and whether there have been any department lapses. They will also send a report to the SSP Moneragala mentioning the necessary actions that should be taken against the Policemen involved. H.M. Kusumawathie who initially brought the case to light and levelled charges against the Police said that four youth, amongst whom was her son, had gone to a sugar cane cultivation at Helamulla area in Galamuna, Siyambalanduva to uproot weeds on August 13 as manual labourers. Ajith (15) one of the five workers had unearthed a small box when he was digging weeds with a mammoty. They had found in the box nine precious stones along with seven rings and a pendant in which the picture of a lady was carved. The five had distributed the valuables among themselves amicably. Suranga (21), son of Kusumawathie, had received three gems, two rings and the box they were found in. Dinesh Saliya (14), who was given a gem and a ring, had sold his gem believed to be worth more than Rs. 1 million for just Rs. 200,000 to a famous gem merchant at Kahawatte, Ratnapura through a neighbour. On the way back home, Dinesh had described the story to a relative in the area and this relative of Dinesh in turn had tipped off the Siyambalanduva Police about the find, citing the names of Suranga and Janaka (22). According to Kusumawathie, when the Police visited their houses on August 30, Suranga had not been there as he had gone for an interview to join the Civil Defence Force. Unable to find the duo and not getting any information from other villagers the cops had gone back empty handed that day. A team of Police personnel with eight homeguards including IP Indunil of Helamulla Police Post, SI Sarathchandra, of the Intelligence Unit of Siyambalanduva Police have allegedly revisited the suspects’ residences the following day on 10 motorcycles. The cops had allegedly grilled Suranga for more than one and half hours and threatened to kill him if he failed to hand over the valuables to them, according to Kusumawathie. When she inquired why they questioned her son for so long, the cops had said that it was none of her business and they just collected some information as Suranga was to join the homeguards. Complainant Kusumawathie said that Suranga had handed over all the valuables he had hidden in his aunt’s house to the cops, not knowing they were priceless antiques. IP Indunil had allegedly told Suranga that he would teach him a good lesson if he breathed even a word of it to anybody. Similarly, the Police had recovered the rest of the valuable stones and the jewellery and also collected Rs. 150,000 and the ring from Dinesh’s possession at gun point. Janaka had run away from the village when the Police arrived, but his share too had been seized by the Police. She said, the four youth were summoned to the Police Station to record statements on September 4 and they were released after seven hours. None of the statements had been read out to the suspects by the Police and they had simply made them sign what was given to them. They had been ordered not to go out of their houses by the Police, Kusumawathie added. Only after OIC Chaminda and a Police team returned to Colombo after recording statements from relevant persons at Galamuna, under the instruction of SSP Amarasinghe, Director Crimes Division on September 14, that IP Indunil and SI Sarathchandra, had hastened to arrest the suspects the following day in connection with keeping artefacts. About five days after their arrest, four persons, including Ajith’s father, were produced before the Moneragala Magistrate on September 16. Kusumawathie criticised the arbitrary actions of the Police and said that innocent village youth were sent to remand prison, while the cops who took the artifacts and kept them illegally were free. She said Janaka had allegedly handed over his share to the Police through a Minister, soon after the incident and had pleaded guilty to the charges against him. The Moneragala Magistrate Court released him on Rs.50,000 bail on November 5. Suranga had surrendered to court through a lawyer on October 31. When the case was taken up in court on November 7, all five suspects were further remanded till November 14 and the applications submitted seeking bail for two of the suspects, who are students aged 14 and 15, were rejected by the court. She sighed: “We are poor villagers who cannot even afford to live, how can we afford to proceed with legal action. My innocent child is in remand with the other four. All the family members, including me, cannot go out to earn something as we are running here and there to obtain their release and to visit them. I was utterly discouraged by what Moneragala SSP Senaratne said when I was summoned on October 18. He said the Police have power to do whatever they wish and asked whether we can go against Police authority. Meanwhile, The Nation learns that one of the homeguards, Amila serving under IP Indunil, who had allegedly been given a ring, collected from the suspects, had committed suicide. It is speculated that he took his life fearing that he would have to face consequences if he was exposed. All indications are Army Commander Lt. Gen. Sarath Fonseka will be given a further extension of one year on reaching the age of 58 in December, in order to complete the job of bringing the LTTE to its knees, militarily. Sources said that with the Army performing well on all fronts, there was no necessity to even consider changing its Commander, especially with the incumbent being held in high esteem by his fighting men. This week saw some key positions in the Army changing hands. Master General Ordinance, Maj. Gen. Asoka Thoradeniya was moved to Army Headquarters with his retirement due on December 8. Eastern Commander Maj. Gen. Dhammika Liyanage succeeded as Master General Ordinance. Maj. Gen. Srinath Rajapaksa, the Commander of 51 Division assumed duties as Commander East. Commander of 21 Division Brig. Priyantha Jayasundera took over the command of 51 Division. Second in Command of 57 Division Brig. Senaka Wickramaratne assumed command of 21 Division. Col. Aruna Wanniarachchi who headed the 52-2 Brigade rose as Deputy Commander of 57 Division. These changes were effected by Military Secretary Maj. Gen. Deepal Alwis. Army Headquarters Sources said soon 33 Colonels will be elevated to the rank of Brigadier. In addition, the Army Commander has ordered raising the cadre of generals in the force by four. At least five senior major generals are scheduled to retire next year on reaching the age of 55, unless they are given extensions by the President. Opposition moves are underway to defeat the government’s Budget for 2009, although the government currently possesses a clear majority to have it passed with relative ease. Against overwhelming numerical odds, the main opposition United National Party (UNP) vowed to defeat the 2009 Budget, claiming it had a moral obligation to do so on the grounds that the proposals are not pro-people. Speaking to The Nation, UNP General Secretary Tissa Attanayake said despite the current numbers in Parliament which give the government a very clear majority with 117 MPs, with the combined opposition comprising only 107, the UNP considers it a number one priority to defeat the Budget. However, the opposition has a tough fight on its hands, with the Wimal Weerawansa led National Freedom Front (NFF) likely to swing the government’s way during the Budget vote, bolstering the UPFA’s numbers to 128. Meanwhile, speculation is rife that the main opposition and the SLFP Mahajana Wing led by Mangala Samaraweera are trying to win back a few UNP dissidents between now and the third reading of the Budget, but given the numerical odds, the opposition would require at least 20 additional MPs to stand a chance. Asked how the UNP would garner the requisite numbers to pull off a Budget defeat, Attanayake responded that it would be done, although the details of the manoeuvres could not be revealed ahead of time. He said the TNA and the JVP had been very clear about voting against the Budget. JVP Leader Somawansa Amarasinghe confirmed that his party has decided it will vote against the Budget. “We will support the vote for the Defence Ministry, but other than that this Budget offers no respite whatsoever for the people,” he said. However, he admitted that the government had the necessary majority to get the Budget passed. The government, meanwhile, expressed confidence that the Budget will pass with ease. “We do not have any doubts about the Budget being passed and we are absolutely sure there will be no difficulty in doing so,” said Leader of the House and Health Minister Nimal Siripala de Silva. The jingoistic comedies staged recently in Tamil Nadu to express 'solidarity' with Sri Lanka's "Eezham Tamils facing genocide" throws light on a truth unpalatable to the island's self-styled peace-makers and anti-war crusaders. It is that as long as the likes of the LTTE proxy, so-called Tamil National Alliance, the loony Left and sections of the Tamil-owned media here do not want to sever their political 'umbilical cord' with the 60 million Tamils across the Palk Strait the large majority of Sinhalas will consider themselves – rightly or wrongly – a besieged community. And that will never be conducive to genuine goodwill among communities no matter what political solutions are imposed on the country. The roots of this siege mentality may be traced back to the time when the Dravida Munnetra Kazhagam (DMK) won a majority of seats in Tamil Nadu - then the State of Madras – defeating the Congress Party in the Indian General Elections of February 1967. According to Sri Lankan Historian, the late Professor Tennekoon Wimalananda, Madras State's then Chief Minister K. Bhakthawaksalam – conceding defeat - said that the DMK victory would mark the beginning of a pestilence that would spread throughout the Madras State. As far Sri Lanka is concerned Bhakthawasalam was prophetic. If we are to refresh our memory, DMK sprang up primarily as a movement against Brahmin supremacy and caste discrimination in South India. Then known as Dravidar Kazhagam or DK, its founder Periyar E.V. Ramaswamy – better known as E.V.R. – belonged to the launderers' caste. The movement led to the formation of DMK as a political party under C.N. (Conjeevaram Natarajan) Annadurai, popularly called Anna. He was Tamil Nadu's first non-Congress Chief Minister. In fact it was during his term (in 1969) that Madras State was renamed Tamil Nadu. The Tamil nationalist theme in the writings and speeches of DK and DMK leaders attracted many scholars, teachers and students who became members or sympathizers of DK and DMK. After the 1967 election victory Anna invited Tamils from Fiji, Mauritius, Malay Peninsula, Mombassa, Tanganyika and Sri Lanka to a conference held to discuss the formation of a World Tamil Movement. The Sri Lankan delegation to this conference comprising 234 members was considered as the largest delegation. Federal Party stalwart M. Thiruchelvam QC was given a special place at this 'cultural' conference. LTTE leader Prabhakaran's lament that 80 million Tamils the world over have no independent state of their own has roots in the ideas raised at this conference. The Dravida Nadu idea ended up as a day-dream since there was hardly any support for it from the other three South Indian States –Andhra Pradesh, Karnataka and Kerala. And DMK failed to fulfill the promises it gave the people in the 1967 election campaign. The party was unable to bring down the price of varieties of grain or increase the water ration given per person in that parched land. So in order to save its crumbling image the DMK diverted public attention to Sri Lanka. The movement hoped to spread their tentacles to the island's Eastern, Central, Uva and Sabaragamuwa Provinces through plantation Tamils. It seemed as if the DMK considered Sri Lankan Tamils the way Hitler looked at Sudeten Germans – all part of one nation. Sri Lanka Air Force fighter jets launched precision air strikes targeting two key LTTE Sea Tiger bases located on the Vettalaikerni coast, Northeastern shores in the island this evening (Nov 3). Air Force spokesperson Wing Commander Janaka Nanayakkara speaking to defence.lk said that the air strikes were launched around 6 PM. He said, the first air strike was taken at a Sea Tiger base located in the Kadaikadu area , 3 Km west of Vettaliakerni at 6.05 PM. The targeted terrorist base has caught in flames , he added citing air intelligence reports. Speaking further he said that the second raid was raid was taken at Sea Tiger base located 1.5 km west of Vettalaikerni. Colombo Municipal Council which has another one and a half years left to complete it term, was suspended yesterday and a retired High Court judge has been appointed to go into the allegations of short comings and lapses against the Mayor and the Municipal Council. Alavi Mowlana, Governor of the Western Province speaking to Asian Tribune said that Colombo Municipality was under the UNP for the past 25 years, and remained UNP oriented. The present lapses and short comings, it was said has been inherited from the past mayors and councilors. But he said that the present Municipal Council has been suspended yesterday and a retired judge of the High Court Hector Yappa has been appointed to go into the lapses and shortcomings and report within a period of three months. Western Province Governor said that it has been found that the CMC had lost Rs 4 billion in the form of uncollected assessment arrears, while the bank overdraft had been around Rs 600 million. He said that there were allegations of waste and corruptions also and the Council will remain suspended until such time the report is presented after the investigation completed by the retired judge. A substantial victory for Barack Obama is now predicted by most pollsters with less than a week to go in the US election campaign. Obama coat-tails would also ensure that the Democratic Party would increase its majorities in both Houses of Congress, possibly obtaining the 60-40 margin in the Senate required to end filibusters and force a floor vote on legislative proposals. A double digit lead is assured in the House of Representatives. John McCain is pinning his hopes trying to win Florida, Pennsylvania, Ohio and New Hampshire. Such an upset is considered a remote possibility. The McCain camp seemed a little disoriented judging by some of the contradictory statements made by campaign people. Meanwhile, Democratic leaders are already trying to down play any contingencies of a less than great victory, if that were to occur. Analysts have pointed out that the implications of a sizeable Democratic victory meant that popular expectations of immediate action on health care, home foreclosures, jobs and other social issues “could be difficult to meet even with enhanced numbers in the Senate as well as the House.” That is a hint that Obama presidency would be saddled with a huge expectations bubble which entails delivering a host of goodies like Healthcare, economic prosperity and educational reform within a short time. Some warned against overreaching and urged a cautious legislative agenda. According to one Democratic legislator, Steny Hoyer of Maryland, “We are going to get new members with a clear understanding that the reason they won is appealing to independents and disaffected Republicans, and they are going to want to continue to do that.” Because the entire the entire campaign had been overtaken by an economic crisis, the outcome may have dwarfed all other issues. Since Vinayagmoorthi Muralidaran (Karuna) and Sivanesathurai Chandrakanthan had joined civil society as normal citizens through the UNP, there was no war situation in the Eastern Province, Galle District UNP member Vajira Abeywardena said yesterday (27). Similarly, Prabhakaran too could be brought into normal civilian society. Neither of the two sides to the armed conflict in the North could win the war and it was necessary to start peace talks with Prabhakaran now, Abeywardena said. Asked for his comment Defence Secretary Gotabhaya Rajapaksa said it was necessary to continue the war against terrorism in the North. Even India wanted terrorism eradicated. There was no question of stopping the war against the LTTE. India was only concerned about the welfare and problems of civilians of the North who were displaced or affected by the war especially with regard to food supplies. The government continued to send adequate food supplies to the north, he said. The Defence Secretary also said that arrests of LTTE activists and supporters in Tamil Nadu were being conducted by the State government and surveillance in the seas between India and Sri Lanka government had been increased by the Indian authorities. Sri Lanka Navy has rescued 19 civilians including 3 children fleeing from LTTE tyranny in Wanni last morning (Oct 27). According to the Navy sources, Navy inshore patrol craft (IPCs), have rescued the civilians while they were battling against rough seas onboard a locally built fishing vessel (Vallam) in the South of Mandativu islet. There were 11 females and 8 males belonging to 6 families, the sources said. The refugees have told the Navy personnel that they had got onboard the Vallam from Murukkandi in Poonaryn. They have further revealed that they had left their homes due to the inhumane harassments committed by the LTTE terrorists. According to the refugees , a large number of civilians in Wanni are desperately expecting that the security forces would soon liberate them from the terror clutches. The Navy would provide food, medical facilities and other basic needs of the refugees until they are being handed over to the civilian welfare authorities, the sources added. Sri Lanka is on the verge of destroying the most ruthless terrorist organisation in the world. Even the most extreme elements in the South of Sri Lanka accept that upon completion of this task certain genuine grievances of the Tamil people and a certain degree of devolution envisaged in the current constitution should be implemented in the Northern Province as it is now being done successfully done in the Island’s East. India knows all this too well. Nevertheless New Delhi and explicitly its South Indian clique is again attempting to repeat their attempts of 1987 save LTTE which is on the verge of defeat. Sri Lankans have a right to decide their own future free any more foreign interference. They have suffered enough for the past 25 years because of Indian meddling the island’s internal affairs. The time has some to say enough is enough categorically and firmly. Much has been written about India’s gross interference in Sri Lanka’s internal affairs and violation of her sovereignty and territorial integrity in the recent past supposedly due to political pressure from Tamil-Nadu. However it is important for all Sri Lankans to comprehend and appreciate the behaviour of Indian politicians in a more holistic context, India has a very loose and fragile regional federal structure (unlike the strong federal systems of government in their new found western allies like USA). Furthermore the fundamental psychology of India’s foreign service and intelligence services operating in the region must be clearly understood. The contemporary developments in the region merit a complete re-evaluation of regional bilateral and multilateral policies that all SAARC countries follow vis-à-vis their giant superpower and neighbour India. In Sri Lanka’s case, India’s strategic objectives has been satisfied with most Sri Lankan’s being absolutely ignorant and unaware of the real status quo – Sri Lanka’s Governments “flying to brief” New Delhi and Sri Lanka Government’s readiness to meet India’s wishes. Even world powers with the exception of China of course, never dare interfere on India’s decisions on Sri Lanka. The trade between Sri Lanka & India places the latter at a greater advantage even where the Free Trade Agreements are concerned. Under the Free Trade Agreement between the two. (24-25 % of Sri Lanka’s imports come from India. And this excludes contraband like sarees, gold, drugs etc. If these added they would change the percentage significantly). As a matter of fact some Sri Lankans naively talk about a nuclear free zone in the region. Hence the Tamil Nadu politicians singing their Katchatvu ‘song.’ If ever India goes to war with any of her enemies I hope Sri Lankans know that stray missiles will all rain on them. Therefore Sri Lanka should not get tied down to any agreement with India on Kachchativu at this juncture. There should be no repeat of what happened with Trincomalee under the Indo-Lanka Accord. Perhaps Sri Lanka having listening post on Katchativu with China’s collaboration might not at all be bad idea considering India current interference in Sri Lankan affairs. If India is not interested in creating a separate state in Sri Lanka, then Sri Lanka needs a categorical assurance that it will not use thae LTTE as a destabilisation force in the country. A minor explosion was reported, at the Central Bus depot at Pettah- Colombo, at around 11.25p.m. No civilian casualties were reported Pettah Police sources said, adding that 2 buses including a public transportation bus bearing No: WP NA 3826, have sustained minor damages due to the explosion. According to latest information from the blast site, the explosion was caused due to a parcel bomb which had been placed between the two busses that were parked at the location. 58 division troop capture Varnnerikulam in Kilinochchi district. In the widely viewed ‘Meet The Press’ in NBC General Powell called Obama a “transformational figure”. Powell also said "the approach the Republican Party and Mr. McCain" are taking on the campaign trail is getting "narrower and narrower" while Obama has been "inclusive." Powell, speaking live in the studio, told moderator Tom Brokaw that he was "troubled" by the direction of the Republican Party and statements by the campaign of Sen. John McCain. One of the nation’s most respected Republican in endorsing the Democratic presidential candidate further said: "And I come to the conclusion that because of his ability to inspire, because of the inclusive nature of his campaign, because he is reaching out all across America, because of who he is and his rhetorical abilities — and you have to take that into account — as well as his substance — he has both style and substance, he has met the standard of being a successful president, being an exceptional president." Indian High Commissioner in Colombo, Alok Prasad called on Sri Lanka’s Foreign Minister Rohitha Bogollagama yesterday at the Foreign Ministry. The discussion centered on current issues pertaining to Indo-Lanka bilateral relations in the context of developments in the North and the East of Sri Lanka. Concerns being expressed in this regard in India were conveyed to Minister Bogollagama by the High Commissioner. In the meantime India’s Foreign Secretary Shivshankar Menon has summoned Sri Lankan High Commissioner Chrysantha Romesh Jayasinghe to express the government’s concern over the situation on Sri Lanka. Furthermore, in New Delhi, Prime Minister Manmohan Singh and External Affairs Minister Pranab Mukherjee expressed concern over the Tamil civilian casualties during the last two days. "We have consistently made it clear that a return to normalcy cannot be brought about by military means or battle field victories. What is required in Sri Lanka is a peacefully negotiated political settlement which allows each community to realize its own potential within the framework of a united Sri Lanka. "Government of India will do all in its power to achieve this goal, to ameliorate the humanitarian conditions in Sri Lanka and has been making representations to the Government of Sri Lanka at several levels. The other issue which is engaging Government’s effort is the harassment and killing of Indian fishermen in neighboring areas which must cease forthwith. Government will be taking steps to ensure this." “As the main opposition party we are extending our unconditional support to the Government in its endeavor to eliminate terrorism, said the Chairman of the United National Party Rukman Senanayake. Mr. Senanayake in an interview with the Sri Lanka Broadcasting Corporation said that it is the due responsibility of the Government to ensure the safety of all citizens irrespective of ethnicity or race. Mr. Senanayake emphasized “no one else has the right to interfere in the internal issues of Sri Lanka”.While admitting that it is the duty and the responsibility of the Government to exercise military operations to combat any form of terrorism, Mr. Senanayaka said that the LTTE is a separatist and a deadly extremist group unleashing terrorism in all its manifestations to achieve their goals. “We should make the international community aware that this terrorist outfit is not fighting for the rights of Tamil people,” he said.Refering to the recent political development in Tamil Nadu with regard to the situation in the North of Sri Lanka, Mr. Senanayake said “What we can do is to express our possition on the matter clearly and it is upto us to address our internal issues”Expressing his views over the killing of Maj.
General Janaka Perera he said “the LTTE might have been in frustration that at a time like this if a UNP Government came to power it may affect the terrorists negatively.”“Terrorists are murderers trying to gain advantage by sowing ethnic disharmony among Sri Lankans,” Mr Senanayaka said adding “we all have to realize that and act accordingly”. The United Nations says that a second attempt will be made this morning to send a convoy of food to civilians displaced behind the lines of confrontation in Sri Lanka’s north. The 50-truck World Food Programme (WFP) convoy was forced back yesterday afternoon after a dangerously close exchange of heavy fire across the A9 route into the Vanni. The UN says that it has renewed assurances from both parties to the conflict that the convoy would be able to proceed this morning unhindered. The 50-truck and nine support vehicle operation carrying 750 meteric tones of food for the estimated 230,000 civilians forced from their homes by fighting. It is the second convoy in as many weeks, and is part of an ongoing operation to supply humanitarian aid to civilians moving to avoid fighting between the Government of Sri Lanka forces and the LTTE. Ceylon Biscuits Limited announces that it has decided to remove all Lemon Puff biscuits from market temporarily. The company stated that the decision was taken considering the adverse propaganda against this product since it is a responsible company until the doubts regarding its products would be cleared. Pranks of Dr. Jayalath Jayawardene to involve the Vatican to prevent the army advancing to Kilinochchi are doomed. Instead of appealing to Tigers to stop killing civilians Jayawardene one time distributed sirens to the border villagers, who believed that turning the wheel will protect them from tigers. This is a kind of gimmick that is practiced by him in order to win the sympathy of both sections of the community are legion. Once he tried to enter Madu and was prevented by the LTTE. Today, Madu Sacred Shrine is liberated by the Army. Instead of thanking the army for liberating Madu he became a self-appointed spokesman of the Catholic Bishops Conference and started clowning before television about what the Bishops said or did not said before Sri Lanka President, until such time he was cautioned by responsible members of the team not to get involved and the Bishops are able to handle it themselves. Before he entered politics he was running around behind many politicians to gain access to the UNP. Once he was bending and stooping over Ranasinghe Premadasa and trying to open the door of the Presidents limousine. Premadasa being astute and a crafty politician inquired from Sirisena Cooray whether this man was a real doctor or from Anton Jayasooriyas acupuncture university. Now he is crying unashamedly for the innocent Tamils who are fleeing from the clutches of the terrorist. He is hell-bent in stopping Sri Lankan Army from capturing Kilinochchi. As he knows that once Kilinochchi is captured he and his leader have no political future in the country. His latest gimmick is to go to Rome to prevent the inevitable happening and dashing his hopes to become Minister of Health of future UNP government. So he thought he would wield his influence to obtain a statement from his Holiness the Pope to stop the army advancing to Killinocchi and liberating the Tamils. But this time he will not be as lucky as the Vatican will not get involved in his diatribes against the government and being a self-proclaimed liberator of the Tamils. It is said that even the Tamils do not take this man seriously. He may have to present his petition to the doorman of the Vatican but his expectations of the Vatican to support the terrorist movement who had killed more Tamil civilians than any other institution will not have any mercy from the Vatican. It is interesting to note Vatican has changed its position and continuously publishing articles against the recruitment of child soldiers. The Italian government is also has been extremely strict and following the terrorist every nook and corner to prevent Italian soil being soiled by the activities. So, Dr. Jayawardene may have to come to Rome and to pay penance for all the sins he has committed in placating the terrorist. Tamil Nadu Chief Minister Muthuvel Karunanidhi gave a half hearted warning to the Indian Central Government after failing to muster support from major opposition party AIADMK in the state assembly. His so called All Party Conference ended up as little more than a DMK confab where a lukewarm warning was issued to the Centre that DMK MPs would ‘consider’ resignation in a the event of inability to bring about a ceasefire in Sri Lanka within two weeks. Though in the past TN State Government’s emotive use of Sri Lankan issues has shaken the Centre in the past several occasions. However, there has been a significant shift since Rajiv Gandhi assassination by the LTTE in 1991. The Centre has limited its role to ‘concerned, but no interference’ in the anti terrorism drive of Colombo.President Mahinda Rajapaksa has said that Sri Lanka wants a political solution to the problem and that he was confident this would be best addressed after defeating the terrorists militarily. He pointed out that there were not many casualties amongst the civilians who were caught in the fighting between the LTTE and security forces in northern Sri Lanka. The situation, where the Tamils are subjected to genocides, which continues for more than 30 years in Sri Lanka and where even (tender flowers-like) innocent infants of thousands of Tamil families too get killed, thus ruining the entire future generation of those families, is getting worsened day by day and hence the Sri Lankan Tamils – who are already floating in a sea of tears – counter the attacks of the Sinhala army, tired and vexed by a tinge of distress “as to whether there is anyone in this world to provide us refuge and save us?” and are waiting for a way, with tearful eyes and a hope as to when these problems will see a dawn?. This all-party leaders’ meeting requests that the Indian government should take immediate steps to stop the war and restore peace and normality in Eelam. Reports state that the Indian government has been extending military assistance to the Sri Lankan government. This meeting requests the Central government to stop the arms assistance immediately, since these helps – extended by the Indian government as a goodwill gesture as a neighbor – are utilized by the Sri Lankan government to intensify the genocides and destroy the Tamils. It is hereby declare at this all-party meeting that, if the Indian government fails to come forward to implement these resolutions and to effect a ceasefire in Sri Lanka within two week’s time, all the Parliamentarians from Tamil Nadu will have to resign en masse. This meeting requests the Central government to provide food, shelter and medicine to the war-affected people immediately, to enable them to run their life after they get displaced on ceasefire declaration and also to extend all possible humanitarian assistance to them. This meeting stresses that the Central government should utilize the assistance of International organizations like Red Cross, in a way to ensure that the efforts of NGOs – who come forward to extend various helps on humanitarian basis – reach the affected people directly without any hindrance. This all-party leaders’ meeting strongly condemns the continuation of atrocities like ‘indiscriminate attacks on Tamil Nadu fishermen – who venture in to sea for fishing to earn their livelihood – by Sri Lankan naval personnel, treating these fishermen in inhuman ways and shooting them to death mercilessly and also requests the Central government to arrive at a permanent and stable solution to these acts, which defy humanity and violate human rights completely and implement them immediately. Vote of Thanks by Chief Minister M. Karunanidhi: I wish to point out here that this event, where all of you have accepted my invitation, gathered here as one unit to express your unanimous opinions to save the Tamil community – which is a most important one and the one which is mixed with our body and life – and to stop the war in the Tamil land of Eelam and to spark a motivation to the Indian government and a caution to the Sri Lankan government, is actually an significant chapter in our history. I also wish to add here that I will undertake all possible efforts to ensure that these resolutions are implemented and we, with the cooperation of all the leaders of our parties, will succeed in that effort. Two shipments of milk powder(Anchor and Raththi) have been detained at the Colombo Port since Friday, Director General of Health Services, Dr. Ajith Mendis said yesterday. He said that the officers at the port detained the two shipments on the same day, after they discovered that they were imported from China. “After we discovered that they were imported from China, we immediately detained them and we sent samples to the Government Analyst in order to find out whether they contain melamine. The stocks will not be released to the market until the Analyst confirms that they do not contain melamine,” Dr. Mendis said. Dr. Mendis pointed out and added, “So, we keep a very close eye on all the milk food imports.”Earlier this month, samples of milk food, which were collected from Colombo, were sent to a laboratory in Singapore to determine whether they contained melamine. Also, the Health Ministry banned the import or sale of several milk products including ‘Dutch Lady’ made in Malaysia.“When news broke out that the Chinese have found melamine in milk food manufactured there, and the contaminated milk powder caused the death and hospitalisation of many babies, there was worldwide panic. The Sri Lanka government has reacted firmly to the message sent by India on Monday that it was both concerned and unhappy at the plight of Tamil civilians in the north of the country, where armed forces are locked in battle with the Liberation Tigers of Tamil Eelam (LTTE). Foreign minister Rohitha Bogollagama read out a carefully worded statement in Parliament on Tuesday. The crux of it was that India had been mislead by LTTE propaganda, civilian casualty had been kept at minimum, and that the Tigers did not represent the Tamil community. But he also made it clear that the Sri Lankan government would continue the military offensive against the LTTE, which he added, were now confined to the Kilinochchi and Mullaitivu districts. Bogollagama said the LTTE had managed to mislead Sri Lanka's “friends” about the situation in the north. “It’s unfortunate that some of our friends too have been influenced by this malicious propaganda,” Bogollagama said, soon after mentioning that Narayanan had expressed concern on the situation in Sri Lanka. Bogollagama added the LTTE did not represent the Tamil community in Sri Lanka. “Therefore, military action against the LTTE should never be perceived as action against our brethren, the Tamil community. We are concerned about them and will work with them to ensure their welfare, security and aspirations since they are our fellow citizens,” he said. President Mahinda Rajapaksa addressing the All Parry Conference today repeated his call to the LTTE to lay down arms and surrender. He said: "I wish to once again very clearly call on the LTTE to lay down their arms and surrender. They should act in this manner and enter the democratic political process. Our aim should be to ensure the democratic political rights of our Tamil brethren." "However difficult it may be, it is my belief that the efforts to find political solutions to political issues should be continued. It is my belief that there are no military solutions to political questions. The people have elected us to realize their aims and aspirations. It is our duty to ensure to the Tamil people of the North have the same democratic rights as enjoyed by the people in all other parts of the country. Military operations have become necessary to eradicate terrorism from the country and enthrone democracy throughout the land," the President said. “He recalled his own participation in several rounds of talks with the Government held under international sponsorship. They had come to an understanding to accept a federal system as a solution. However, Anton Balasingham, without consulting Prabhakaran had issued a statement stating that they were willing to consider a federal system. When he discussed this with Prabhakaran he rejected the idea of federalism. He wanted the talks dragged for at least five years till the LTTE obtained enough arms to strengthen itself further. That was when he decided to leave the LTTE. It was called a renegade for talking this decision, which was done after he had explained to Prabharakan the futility of the armed campaign they were engaged in where at least 80,000 people had lost their lives. He said the President had brought about many important changes in the East with free and fair elections and that all communities in the East were today participating in the development process there. “I welcome you all with all respect, and thank you for being present at this meeting at such short notice. “We have today reached an important juncture in the difficult path of eradicating terrorism from our motherland and ensuring the dawn of peace. We seek this peace for all the people of our country. Similarly, what we look forward to is a peace that will ensure to all citizens, whether in the North, South, East or West equal rights and privileges, to be enjoyed in freedom and dignity. “The political parties gathered here are those that have the highest regard to the democratic system, ands have great confidence in it; it is satisfying that they all value democratic thinking and follow the principles of democracy. We are also encouraged by the fact that all of these parties comprise those who take great pains to achieve the economic, social, cultural and political aspirations of our people. “I wish to emphasize the importance of all of us have come together so as not to betray the people in their eager search for democracy and peace, away from the path of violence. “You will recall that in January this year the All Party Representative Committee presented a set of proposals. It is the expectation of the government to carry these proposals forward and implement them. Especially, in the context of our Constitution not being properly implemented, such the full implementing of these proposals cannot be done immediately. They should be done step by step. Already this is being implemented well in the Eastern Province. At the same time, the military operations are continuing in the North, to free the people there from the yoke of terrorism and ensure them of their democratic rights and freedoms. “There should be a proper environment to fully implement the proposals of the All Party Conference and the All Party Representative Committee. The current military operations are being carried out to build that required environment. They are not intended to harass the ordinary people, or cause harm or hardship to them. Our policy in this regard is very clear. It is that we continue with these operations to free another group of our own brothers and sisters from the cruel grip of terror. “I wish to state our satisfaction that the entire machinery of government led by the respective Government Agents, is carrying out fully coordinated work together with the International Red Cross and the United Nations to ensure the welfare of the civilians who are faced with some hardship and have been temporarily displaced due to the current military operations in the North. “I wish to state that all hardships faced temporarily by our brothers and sisters in the North will be brought to an end in a short time. Similar to what we did in the East, we will soon make arrangements to bring normalcy to the lives of our fraternal citizens in the North, and provide them the opportunity to elect their own political representatives to the constitutionally established political institutions. “You are aware that we are taking action to properly implement our Constitution. Similarly, the local government bodies and provincial councils are being strengthened. What the All Party Conference should do now is to discuss and agree on measures towards stabilizing this political process, and discuss the further measures necessary to achieve peace. This should be done in a manner that is fair by all communities. Such measures should help in raising the living standards of all communities. Also, we should build an environment in which every citizen will be able to live in peace and satisfaction. The representatives of the parties present supported the President initiative to end terrorism and restore peace in the country, and also the measures being taken to ease the temporary hardships faced by the people of the North due to the ongoing military operations. Representatives of the following parties were present: Sri Lanka Freedom Party, Lanka Sama Samaja Party, Communist Party of Sri Lanka, Mahajana Eksath Peramuna, Jathika Hela Urumaya, Sri Lanka Muslim Congress, and Ceylon Workers Congress. Up Country People’s Front, National Unity Alliance, United National Party Democratic Group, Eelam People’s Democratic Party, All Ceylon Muslim Congress, National Congress, Western People’s Front, Thamil Makkal Viduthalai Pulikal, National Freedom Front. Government sources said that the President would have skipped the event due to his scheduled meeting with the visiting Palestinian President Mohammed Abbas. The blast hit the convoy about an hour before the Palestinian leader arrived at the Bandaranaike International Airport. 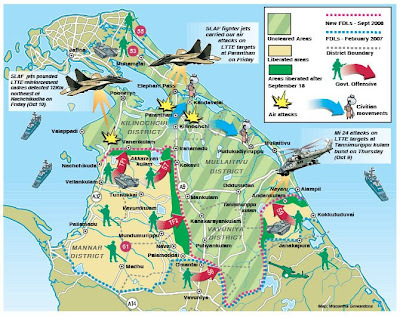 Sri Lanka Air Force fighter jets launched 4 air strikes targeting 3 vital encampments of LTTE terrorists this morning (Oct 10), air force sources said. Air Force spokesperson Wing Commander Janaka Nanayakkara speaking to defence.lk said that the first of the 3 air raids was taken at 6.30 AM targeting an LTTE communication centre located 3Km , northeast of Paranthan. In addition, two air raids were taken at 7 AM targeting an LTTE leaders' hideout located 2km northeast of Kilinochchi town, he said. At the same time, the third air strike was taken targeting a den of LTTE suicide bombers, also known as Black Tigers located 1.5 Km west of Paranthan, he added. Speaking further, Wing Commander Nanayakkara said that all three targets were effectively engaged. At least 19 LTTE terrorists were killed and 9 others reported wounded during battles ensued between troops and LTTE in general area Akkarayankulama, in the Southwestern perimeters of Kilinochchi on Tuesday (Oct 7), according to Wanni military sources. Troops acting on information found a complete explosive jacket worn by LTTE suicide cadres, 2 claymore mines and 3 AP (anti personal) mines from a jungle area in Nilappanikkanmalai, Kuchchiweli in Trincomalee district, this morning (Oct 8). Sri Lanka Air Force MI-24 helicopters raided 3 separate LTTE gathering places located in Mullaittivu front this evening, 8 October.The air raids were carried out around 5.40 p.m. targeting identified LTTE gathering places located in general area Kumbulamunai, western edge of Nayaru lagoon in Mullaittivu, Air Force spokesperson, Wing Commander Janaka Nanayakkara said. Two Sri Lankan Special Task Force (STF) officers were killed near Kagnchikudichchaa'ru STF camp around 9:45 a.m.
Supreme Court today ordered former Chandrika Kumaratunga to pay Rs. 3 million to government over the Water's Edge land transfer. Court also ordered businessman Ronnie Peiris to pay Rs.2 million and return the land to the UDA. UK based businessman Ronnie Peiris has settled a tax probe by the Inland Revenue Department to the tune of Rs. 60 million and more over the controversial Waters' Edge Golf Club land transaction initiated during the administration of former President Chandrika Kumaratunga. According to Finance Ministry sources, Peiris eventually settled a claim by the Department for the payment of his share in the transaction. Peiris is Group Finance Director and President of John Keells Holdings and has overall responsibility for Group Finance, including.